Chris Agutter praised the impact of Calum Davies after the young forward’s remarkable start to his Hastings United Football Club career. The 19-year-old has scored five goals in three games, including a match-winning hat-trick against Ashford United on Saturday, since signing from Leatherhead on Tuesday, last week. 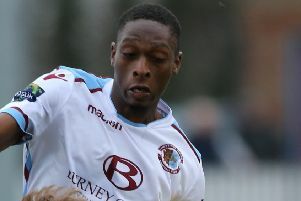 Hastings manager Agutter said: “He’s done really well. You can see why we’ve been after him for a while. He’s a very, very good finisher and he’s got real quality as well. He doesn’t shoot if you like, he finishes - he passes it into the net. “With the way we play, he doesn’t get involved too much in the first 75 yards of the pitch. But when we get into the final third, he comes alive. If we give him the service, he will take the chances. Over the course of the three games, he’s had seven shots on goal and scored five. Davies is already Hastings’ joint highest scorer this season and is leading the line for a side which Agutter believes is making ‘huge progress’. The 3-1 win over Ashford and 2-2 draw away to Horsham on Tuesday night have extended Hastings’ unbeaten run to four Bostik League Division One South matches, three of which have been draws. “We’ve been excellent,” continued Agutter. “We’re becoming more consistent. I’m starting to know what we’re going to get from the team. “In the first few games I was in charge, I think I almost had a heart attack on the touchline - you never knew what you were going to get. Now we’ve had a few more training sessions and two or three new signings, we’re becoming more consistent. “We’re dominating possession and we’re in control a lot more. The more we have the ball, the more we can master our own destiny. We’re more athletic and mobile, and when we lose the ball, we can win it back quickly. “We need to be more ruthless. We’re not ruthless enough in both boxes. If we do that, we really are on an upward curve. But that will come. “The progress we’ve made over the last three or four weeks has been more than I anticipated. I think the supporters can see the progress as well in terms of the style we want to play. The young Hastings side will have three opportunities to perform in front of its own supporters over the next eight days, starting against VCD Athletic tomorrow (Saturday, kick-off 3pm) and Chipstead on Tuesday (kick-off 7.45pm). Agutter said: “The most important thing for me is when the supporters come away from the next three games, they think ‘that was good’. Sam Beale hopes to return from injury for tomorrow’s game, which will be the final one of Jack Dixon’s suspension. The holding midfielder Agutter was hoping to bring in last week has gone on loan to a Bostik Premier club, but he is speaking to a centre-half, right-back, holding midfielder and a box-to-box midfielder.